Knit rows 1 - 16, clip your yarn tail, and thread through final 8 stitches. Pull tight, thread to inside of hat, and knot. And now skip to the verrrrrry end of the post (right above the pictures), for the last bit of instructions. And while you in-the-round knitters are doing that, I'll finish up with the straight needle knitters. So if you're working on straight needles, pick up here! Knit decrease rows 1 - 16, and then thread final 8 stitches to a scrap of yarn to hold for later. Beginning from where you stopped doing decreases in the original pattern (and where the in-the-round knitters switched to the round), seam hat. When you reach the top, pull seaming thread through final 8 stitches and pull tight. Thread to inside of hat and knot. Make 2 roughly 6" yarn tassels (instructions here) and attach to bottom corners of hat. Tuck in ends. Finally, if you completed this hat in the round, you may want to knot together the two stitches where you joined this hat in the round - although it should be fine structurally either way, knotting them will prevent them from pulling apart when this hat is worn. And let's face it - with a hat this cute, you're going to be wearing it a LOT. So glad to hear that you like the pattern, I'd love to see the finished result! The easiest ways to get me pictures are either by email (ballstothewallsknits@gmail.com), Facebook (https://www.facebook.com/ballstothewallsknits), or tagging me on Instagram (https://www.instagram.com/ballstothewallsknits/). I can't wait to see your project!!! Thank you for a wonderful pattern, I will send you a pic very soon. Looks lovely and can't wait to investigate stash for appropriate yarn. Thanks for a wonderful start to the day and makes my knitting fingers itch to begin. This one is so adorable. You never cease to amaze me. Thanks TerriSue! I knit this one for someone in particular, which always makes it fun. And helps me come up with new ideas! This one is so original! I might have to try it! Or have you knit one for me? Here! here! yes, that yarn is gorgeous. Great choice of pattern in which to use it. Thank you for this great pattern. It was my first try at the "twist" stitch and it turned out fine. Thanks again! Question: On Marker Placement Row, I end up with markers placed asymetrically--10 stitches - marker - 82 stiches - marker - 26 stitches. Is this correct? Am I reading the directions correctly? Duh! I just checked my math and I see what I was doing wrong. should be 18 - 82 - 18. Sorry for the dumb question. No worries! I'm always happy to answer questions (and I love it when people figure out their own answers!). :) Let me know if you have any more! Thanks Gretchen, it's funny how I see the parentheses and ignore it! Thus creating my problem! I'll post a picture of the bonnet on Ravelry when it's competed, a gift for my cousin. Gretchen, I'm currently working on this pattern on straight needles and I've just finished up row 5. As I was doing row 5, I noticed I have 3 extra stitches so I came off of row 4 with 113 sts instead of 110. Is there a way I can decrease that you recommend so I won't end up messing the whole bonnet? That does make sense but my three stitches seem to be in the middle, like 16-79-15. Ripping ferreted out the culprit: a botched twist. Everything lined up when I went back. Wonderful! Glad you found it. :) Sometimes those twists just don't go as planned!!! Wow! You always reply so quick!! I love it! could I add 32? is each pattern piece 16? I will try to find some worsted wool soon. I never have the right stuff around! so frustrating. I can't find the right stuff for your adorable boys hat the red one full around head and neck. I'm looking. I either find even more bulky or too thin. Also, these are supposed to be separated by plain knit rows, right? Thank you! I assumed that it said k11, and just knit away! :) I had two plain rounds before the first decrease round, and added 3 plain rounds after the first decrease, 2 plain rows after the next two, 1 plain row after the next two again, and then knit the rest of them every round. It worked well. I also modified it a bit to be slightly deeper by joining the work ten rows after the pattern told me to, and extending the lattice pattern for another eight rounds. I used a slightly thinner yarn than you did and wanted to compensate for that, and also wanted a slightly more slouchy hat with room for a small hair bun, since I always wear my hair up in the winter. If you want to see the result (and see my mods written up) I'm aviganavigatrix on Ravelry. Thanks for a great pattern! Thank you! I'm so glad you're enjoying it. :) I have a lot of fun making them! Thank you so much for your immediate reply. I'm so sorry I cannot understand what you exactly mean by "in the round or back and forth". Maybe you mean knitting with circular or straight needles? If it is, I prefer working with straight ones. Any way, I would extremely appreciate your help with a modified pattern. Thank you so much again!!! Yes, I meant circulars or straights. :) And you can find the revised pattern below. Of course, I haven't knit it, so please let me know if there are any problems! Oh, and I had to post it in two separate comments, since it's too big! Knit decrease rows 1 - 14, and then thread final 8 stitches to a scrap of yarn to hold for later. Beginning from where you stopped doing decreases in the original pattern (and where the in-the-round knitters switched to the round), seam hat. When you reach the top, pull seaming thread through final 8 stitches and pull tight. Thread to inside of hat and knot. Finally, make 2 roughly 6" yarn tassels and attach to bottom corners of hat. Tuck in ends. Hi Charis! I hope this pattern works well for you. :) I can only imagine how cute your granddaughters will be in them! And I went to Athens once, over Christmas. Everything was closed so I sat in my hotel room watching music videos. Next time I go I'm hoping to make it to the islands (and I won't go over Christmas)!!! To be honest, Christmas is not the right time to visit Greece. It's November and the temperature is still about 24-25 degrees here in Athens! But in summer, or spring is ideal everywhere and especially on the islands. My name is Templa ....for some reason couldnt comment using my account...Getting ready to jump in to this project... its beautiful! And going to be great Christmas gifts. I hope I don't end up with more questions than this ...but on this pictured hat I love the tassles. Is there anyway to guesstimate how much yarn it took to make them that big? Or how many times it was wrapped around the cardboard? Any help would be great! You're a gem!! Thanks so much!! Ok....super excited!! 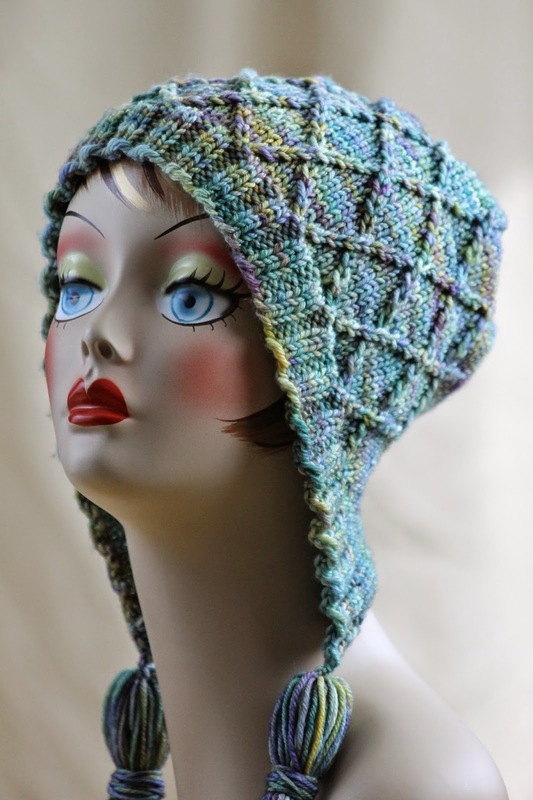 I did mine in a pink and green and brown variegated yarn from Caron simply soft.....it's so adorable. ..I wanted to post a pic but I can't :( anywho I did a tiny revision.....when finishing....instead of holding your 8 stitches at the top and sewing up....instead i pulled my yarn through and seamed down...was a bit easier....thank u again...and I'm gonna go get started on a few more! Oh the tassles advice was perfect! Happy holidays to you and your family..you've given a great gift to everyone! Is this sized for a child? I did the gague swatch and even went up in needle size and this barely stays on my 22" head. As requested, here are in-the-round instructions for an adult large version of this hat. As always when I haven’t knit something myself, I may have missed something or failed to think something through properly. Let me know if there are any problems! Knit rows 1 - 16, clip your yarn tail, and thread through final 9 stitches. Pull tight, thread to inside of hat, and knot. Make 2 roughly 6" yarn tassels and attach to bottom corners of hat. Tuck in ends. 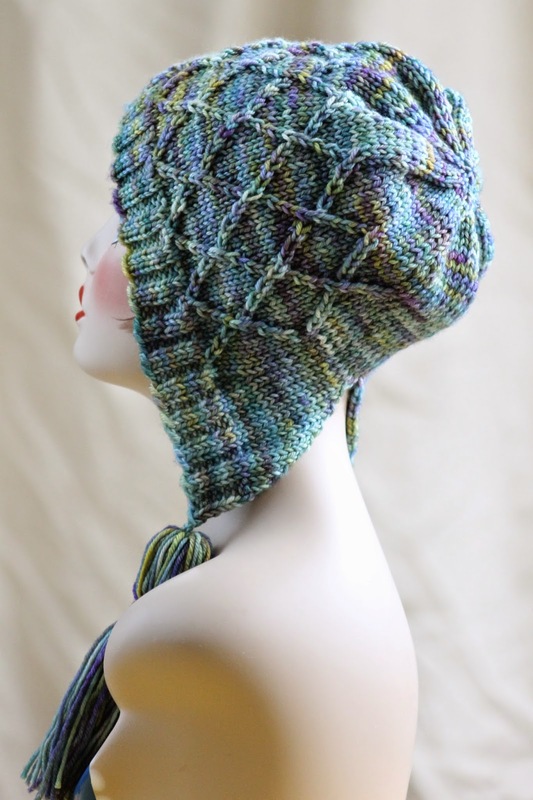 Finally, you may want to knot together the two stitches where you joined this hat in the round - although it should be fine structurally either way, knotting them will prevent them from pulling apart when this hat is worn. Just trying this pattern and after the rib on the marker row you end up with 18 before 1st marker and 20 after 2nd marker. I've undone it once already because I THOUGHT i HAD IT WRONG. Oops caps lock, not shouting. What's the solution? Make it 19 at each end? Hi there! The pattern is 118 stitches in total, 18 before the first marker, 82 between the first and second, and 18 after the second. Is it possible that you're accidentally placing the final stitches from the middle section after the second marker? Hello, What size circumference head is the small adult & large adult? Yay! I'm so happy to hear it. :) And it sounds like you will make some people very happy this Christmas!!! Hello, I'm going to try this in DK wool on the larger size.... will let you know how it goes.. Stunning. I will make it for my daughter as m6 next personal project. I do knit to sell. If I made this and it sold would that be okay? Would you like any money? I knit for the cost of yarn plus 30 to 40 dollars, more to support the habbit, certainly won't retire so I keep my day job. 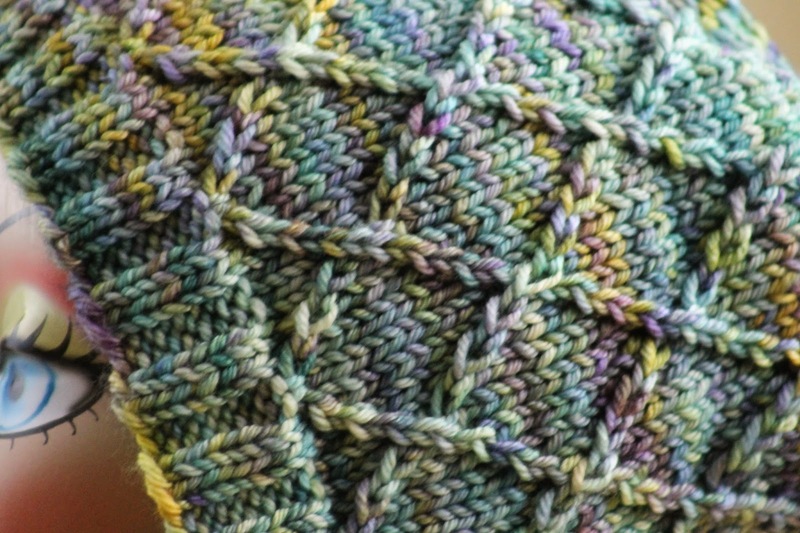 After the initial 16 round pattern, do you knit rows 1-16 or repeat rows 1-16? Same with decrease section? Eep! Apparently I haven't been checking my spam folder, which is where this comment turned up! I truly apologize. Anyway, I always give the total to knit - so if I write out 16 rows and then say "knit rows 1 - 16" I mean to knit them once, not twice. Again, sorry I'm a million years late!!! After the first 16 rows, I take it the 1-16 next is without the decreases? What a beautiful bonnet... it is like a work of art! Do you have any measurements for the ribbed edge (the k2,p2-part) - the full length measured flat - without the tassels? I'm glad to hear you like the pattern! :) And the ribbed edging measures about 26 1/4 inches in length. Let me know if you have any other questions! I was thinking of making the ribbed edging and the earflaps a little extra long, like 28 inches (as the edging tends to «shrink» somewhat due to its ribbed structure) - while keeping the rest of the hat (the part after joining in the round) more snug and fit around my head (22 inches). My gauge for the ribbed edging with Malabrigo Rios yarn is 35 sts = 7,4 inches. So casting on 118 sts will only make the ribbed edging 25 inches. So I might need to cast on 134 or 142 sts. But I would like to arrive at 96 sts for the "in the round-part», because I don´t want the whole hat to be an XL-size. Do you see what I mean? 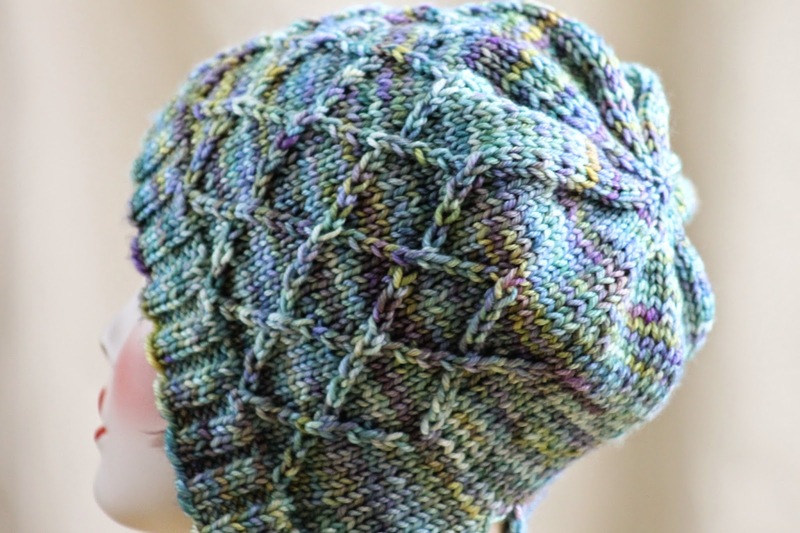 I don't think you will have trouble making these changes - you can simply build double decreases into the hat instead of the singles (so instead of starting with ssk, knit until you have 2 before marker, k2tog, just do ssk, ssk, knit until you have 4 stitches before marker, k2tog, k2tog. You will need to figure out the math on exactly how you'll do it once you figure out your cast on number (or I can help you with that). I don't think you need to be too fussy, though! As long as you build the decreases in regularly it should look great. Just don't forget to place your stitch markers differently if you change your cast on number! You will still want the same number of pattern stitches in the middle, just more stitches on each side. :) Anyway, like I said, if you determine your cast on number and want more guidance I'm happy to help. I also feel confident telling you that you should be fine to do it yourself! OK :) But IF I was to keep the same amount of decreases per row (4), but instead increase for some more rows, the earflaps would just become a little be wider, right? How many sts should be left on the sides of each marker/earflap- in your original design with 118 sts cast on - before joining in the round? I have casted on 134 sts now, and finished with the ribbed edging. I am not quite sure about your first question - are you saying you would keep the decreases the same but knit the diamond pattern for one more repeat? Yes, you could definitely do that, although the hat would become deeper, so it would fit differently. Otherwise - yes, you should have 82 in the middle and 26 on each side. The diamond pattern repetition takes 8 stitches, plus some side stitches to make it look right. As you can see from the pictures, however, it doesn't go all the way around the hat. Hi Gretchen, thank you so much for answering all my questions. I'm self taught and relatively new to knitting. After I knit the edging and the marker placement row and row 1, I have 118 stitches 18-82-18. When I knit row 2 I have 116 stitches 17-82-17. The pattern says I should have 114 stitches. What am I missing? Happy New Year. Thanks a lot I was taking ssk as slip stitch knitwise. I am quite used to knitting but I have a query that may seem obvious to you. When you say "slip marker" does this mean slip i.e don't knit the marked stitch just slip it? I am now quite clear about the placement of markers. They are on the needles between stitches. The problem I continue to have is that in row 2, working over the 82 constant stitches, starting with a knit stitch and working the twist and knit stitches as described, I end up with 3 stitches before the marker. I have knitted up to row 12 four times and have stopped and started again because there are two extra stitches on on side of the patterned section. I have printed off a grid and marked out the pattern and still cannot see where i am going wrong. Indeed, if you take of the knit stitches at the beginning of the patterned section, you are left with 80 stitches. If you then divide those 80 stitches by the 6 stitches that compose the pattern, you do not have a complete final 6. I cannot get past this problem, help please! I can see my error very clearly now and will start again soon! 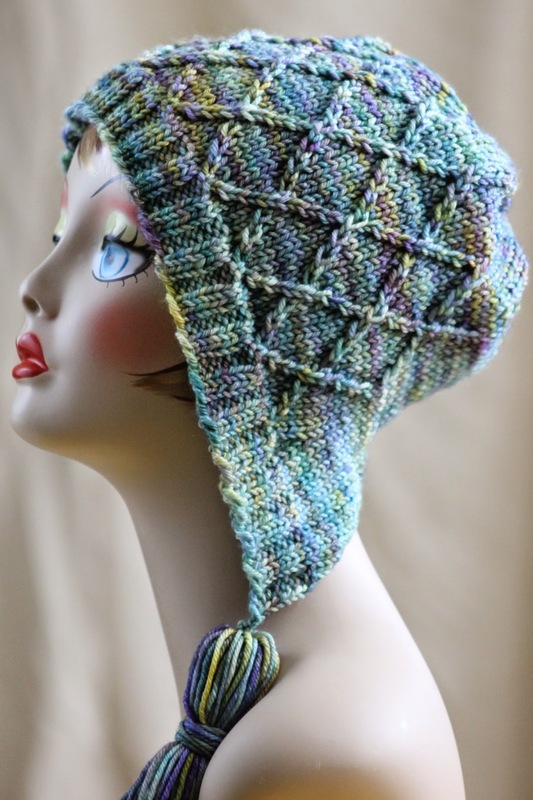 Love the hat and am just starting the pattern at row 1, purl all wrong sides where you do the left and right twists. I am counting ahead a bit to make sure I'm doing this row 2 correctly and end up with the correct counts. I currently have the 118 stitches. I have 18 on each end before/after the markers and 82 between the markers. No matter how I count this out, I have 100 stitches at the end of row 2, not 114. So I'm decreasing each stitch by one on the first 18, leaving 9, no decreases between the markers, and another 9 decreases after the second marker. I'm getting 9 before, 82, 9 after, that comes to 100, not 114. What am I missing? Thank you for the awesome pattern! Oy! Brainless I am. I just walked away from the pattern and came back to it, picked it up and read row 2 again. It is a ask, then knit, then k2tog. I was decreasing the whole time before the markers. Duh. Sorry to bother you with this, just ignore my previous post question. Thank you for replying so quickly. I really love this bonnet and hope i get it right this time. I will look at it again and try to work out where I have gone wrong. Mine is a simple question (I hope). On the pattern, the Gauge shows that 18 stitches = 4 inches. Is this using size 5 or size 7 straight needles.Thank you. Further to my question about the gauge. It usually consists of number of stitches and number of rows. But only stitches are mentioned. Can you please explain this in more detail. Thank you. I’m getting ready to knit the adult version, but I just wanted to double-check the gauge. The pattern begins with 18 stitches for 4 inches, but this comment is 26 stitches for 4 inches (on US 7). It’s a bit of a difference so I hope to hear from you as to which I should swatch. Thanks! I really want to make this hat. You are very talented and I have to admit that is is going to be the most technically difficult project I have ever taken on. I would like to use a Noro 50/50 silk/wool, it is 100 gr but the yardage is only 150 meters. Do you have recommendations regarding stitch count and or needle size variations or do you not advise this substitute? One of thing I did not make clear is that I only have one skien. I bought it from a sale bin a couple of years ago. This Noro is called Kogarashi. The tag says 100 gr, 150 meters, US 8 or 10 mm. I just want to get this right the first time. Ok, the tassels were probably going to be omitted or likely replaced with something smaller. I am older than you and the tassels are a little too young for my taste. By changing needle size would you just knit the whole thing on a 6? ......and where would you reduce the stitches, is that going to make the hat small, my head is 22" circumference. Still wanting to consider everything before I dive in. Oh sorry, I meant the ribbing on 6's and the bulk of the hat on 8's. :) And if we cut 8 stitches and you were getting 16 stitches = 4 inch gauge then the hat would fit perfectly. If you're strongly considering this project I suggest making two small swatches, one on size 7 needles and one on size 8 or 9. Then you can figure out your gauge and there will be a lot less guesswork involved! Hi Stephanie! First off, I apologize but I am out of town and working from my phone so it's a bit harder for me to look back at the pattern to help. However, it doesn't sound like your stitch pattern is messed up, just the number of stitches you have on the edges? If that's the case I really wouldn't worry about it - decrease slightly lopsidedly if you need to to even the stitch count on either side and get to the number of stitches you want for your hat, and then proceed from there! I don't think you'll even notice when you're done. Ah hah! Gotcha. Still though, I wouldn't worry too much. Count out the repeats and see if you're actually missing a stitch or if you've added a stitch or anything, and then just increase/decrease to compensate. Yes, it will be a small error but nothing you'll see in a finished piece! I am a perfectionist, personally, but I've learned that knitting is not nearly as fussy as I am!!!! Can you tell me what ssk stands for? Have sorted needle sizes in mm's and sorted out appropriate yarn but can't decipher 'ssk'. Thank you so much for your prompt reply. Can't believe that I didn't know that for the amount of knitting I have done throughout my life. No worries, it happens! :) And let me know if you have any other questions!!! Hello! What an awesome hat for a cold Canadian winter. I am looking forward to trying out this pattern, but I need help with the yarn weight. I don't understand what 210 yards [192 meters]/100 grams means. Is this a worsted weight? Thanks for the reply Gretchen...I appreciate it. I missed the tag at the bottom...oops! And I love the Craft Yarn Council weight guide. Perfect! Thanks again! Hello Gretchen. I have been knitting the large size hat that you posted higher up in the comments...casting on 126 stitches. I am wondering if there is a math problem in the instructions with the first 16 rows and the decreases...row 2 and 4 are correct leaving you with 120 stitches. But then row 6 decreases by 4 stitches, therefore should leave you with 116 (not 118). Then the remaining rows need to be corrected by 2 each. Total number of stitches should be 106? Am I wrong? I was so puzzled after row 16 that I had only 106 and not 108 stitches. I went back and this is what I figured out. I haven't gotten to the decreases for the crown of the hat yet. But I assume there will need to be corrections for that math as well perhaps? Anyway, it's a great pattern and I've been enjoying knitting it so far. I've now gotten to the decrease for the crown. Row 2, I end up with 98 stitches, ending with K10 and no stitches left for the last decrease. I'm thinking maybe I should start that row with a K2Tog, then proceed with K10 K2Tog? Can you help me out on that? Just finished this hat for my daughter. I used a lovely green yarn. Just have to put on the tassels. Will post a picture on your Facebook page. Yay! :) Thanks for sharing, glad it worked out!!! I'm going to try a pair of fingerless mitts to match. Hi there! This is really lovely, can't wait to give it a try! I'd love to use some wonderful 3 ply ww alpaca but I'm afraid I have only 200 yds rather than 210. Would using another yarn for the tassels stretch it out enough? Thanks! HI Gretchen! Thanks for this great pattern! I am wondering about the decrease section. I'm working in the flat. Are the decreases supposed to line up or are they scattered? The picture looks like they line up but mine are not. Also, is there any way to avoid having the decreases right at the edge? They make it a bit more difficult to seam the finished item nicely. Thanks for your reply and happy new year! I've ripped back to start the decrease section again. Maybe I will have better luck with it this time around. I may just give myself some markers to keep me on track. I the I will try doing the decreases by moving them in from the edge by half the number of plain stitches. It should still be symmetrical and have the same number of decreases without any on the very edge until the few final rows. Hi, I have a problem that I cannot figure out for the life of me. I have gotten to the second half,where you do the 1-16 rows again but without the decreases, but row 2 is not lining up with row 16. I have re-worked the hat twice and still have the same problem and was hoping maybe you could help. I've looked back over the pattern and I only have one decent(ish) idea for you; perhaps you're thinking that row 16 is just like row 8, where you just work crosses. However, on row 16 you also had two twisted pattern stitches that you sort of abandoned from row 14 - the first rt, one stitch in from your first marker, and the last lt, one stitch away from your second marker. Maybe row 2 looks like it doesn't line up because you're forgetting about those stitches, so the immediate lt seems to come from nowhere, when in fact it's picking up on the pattern from row 14? Thank you for getting back to me so quickly! I will go back over what I have done and see. Thank you again. hi, I like ur hat, beautifully done . I started with it but stuck in doing rt n lt... not able to decipher it, as i am getting 2 sts at a time in the needle. so when i do the purls on the wrong side shd i do them separately or 2 at a time (counting it as one )??? while seeing the pattern on the hat I dont see ant twisted sts but feel them as slipped stitch done in a rhombus shape. where I am wrong?? I was shopping for a merino wool hat when I stumbled on your site. 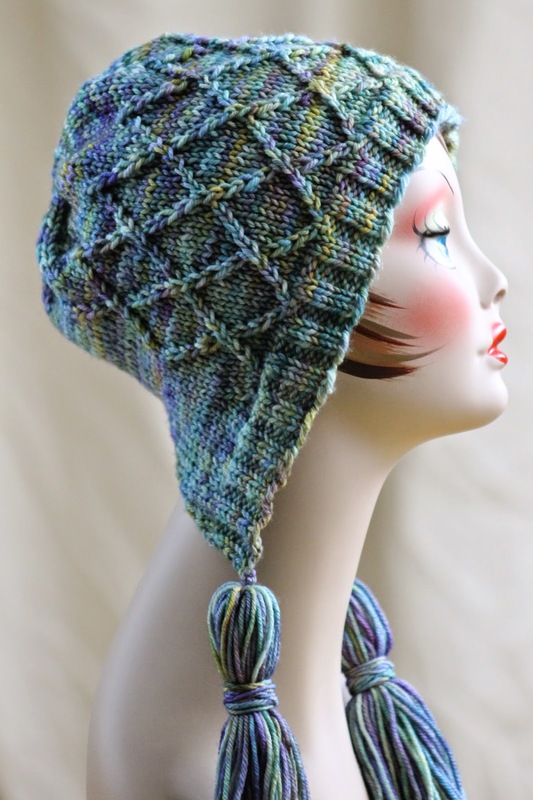 You have many beautiful designs and I have been inspired to get back into knitting. I just picked up Malabrigo Rio 863 Zarzamora for this project and I am anxiously waiting for my needles to arrive. (I didn't have the size among my collection so I order an interchangeable set since I plan to make some of your other hat projects.) Thanks for your generosity in sharing your designs - Emily. I'm glad I could be inspiring for you. :) And I think that colorway will be amazing - let me know if you have any questions! For gauge, should i get 4" with the size 5 or size 8 needle? The larger one! :) Let me know if you have any other questions!!! Apologies, but gauge conversion takes quite a bit more time than size conversion and there's no way I'll get to it before the weekend! :) Let me know if you're still interested though and I'll let you know when I have a converted pattern available. Knit rows 1 - 18, clip your yarn tail, and thread through final 9 stitches. Pull tight, thread to inside of hat, and knot. And now skip to the verrrrrry end for the last bit of instructions. And while you in-the-round knitters are doing that, I'll finish up with the straight needle knitters. So if you're working on straight needles, pick up here! Knit decrease rows 1 - 18, and then thread final 9 stitches to a scrap of yarn to hold for later. Beginning from where you stopped doing decreases in the original pattern (and where the in-the-round knitters switched to the round), seam hat. When you reach the top, pull seaming thread through final 8 stitches and pull tight. Thread to inside of hat and knot. Make 2 roughly 6" yarn tassels and attach to bottom corners of hat. Tuck in ends. Finally, if you completed this hat in the round, you may want to knot together the two stitches where you joined this hat in the round - although it should be fine structurally either way, knotting them will prevent them from pulling apart when this hat is worn. And let's face it - with a hat this cute, you're going to be wearing it a LOT. Ja, natürlich! :) And send me the link or the finished result, please - I'd love to improve my knitting German! Hi. 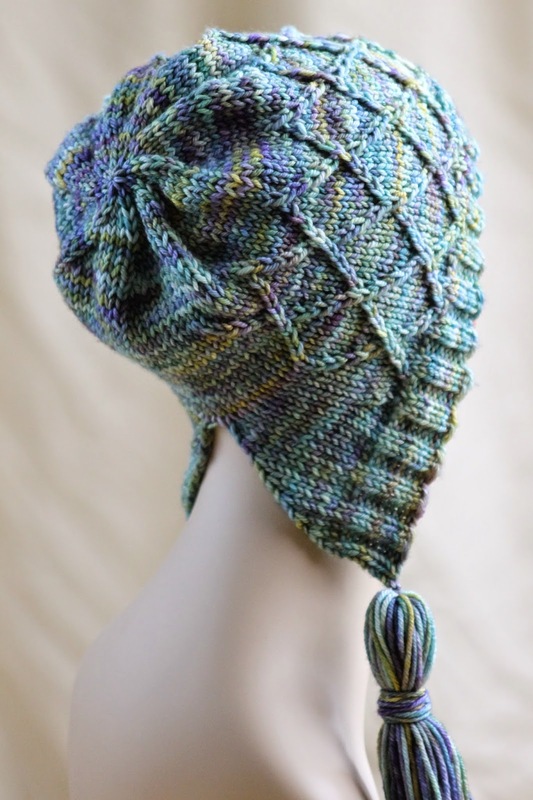 I love this pattern and I think I can handle making it even as a relatively inexperienced knitter. However, I did have one question: You suggest using Malabrigo Rios. I want to use Malabrigo Worsted Merino Yarn because I found a colour I can't live without and they don't make it in the Rios. The weight and yardage between the two are the same, but the Rios is just worsted (19-20 sts/4in) while the Malabrigo Worsted Merino Yarn is listed as heavy worsted (16-18 sts/4in). Is that a close enough substitute? Ah yes, I know this dilemma well!!! :) And if I were you I would just go for it - that should be close enough and it's definitely something that I would personally do in the same situation (just use the needles recommended for the pattern, not the yarn!). Glad you got it sorted!!! :) Let me know if you have any other questions. In the instructions, after Row 16, when you say: Knit rows 1 - 16. Now you’re going to be continuing in pattern, except without the decreases, like so: Does this mean to repeat Rows 1-16? After a search, I found your pattern for your pretty cap. I plan on attempting the large size that you've included in your comments. Thanks so much for that! Thanks so much for coming back to me so quickly. Really appreciated. That worked out nicely. It hadn't occurred to me that it was only the part in brackets that should be repeated 4 times, I was including the k2 prior to the brackets. So that has sorted the problem out. Will keep going. This is a test run really with a fairly basic dk wool. Will hopefully work out any errors along the way, before working in more expensive wool. And please, let me know if you have any more questions! Hello, I love this pattern and have been working it for a while, but I am stumped. Since so many people have knitted this pattern successfully, I can only guess the error is mine. I have ripped out and started twice now and still come to the same error on Row 10. "Row 10: knit until you reach first marker, slip marker, k3, * rt, lt, k4 * until you're 7 stitches before second marker, rt, lt, k3, slip marker, knit until end of round"
After I repeat *rt,lt,k4* 9 times between the markers I end up with only 6 stitches left over. What am I missing? I have the proper 104 stitches on flat needles at this point. 11 (marker) 84 (marker) 11. Which means you should have 82 stitches between your middle markers. :) If your twisted stitches all line up correctly I recommend just fudging somewhere to get things correct. Otherwise, unfortunately, you may need to rip back. 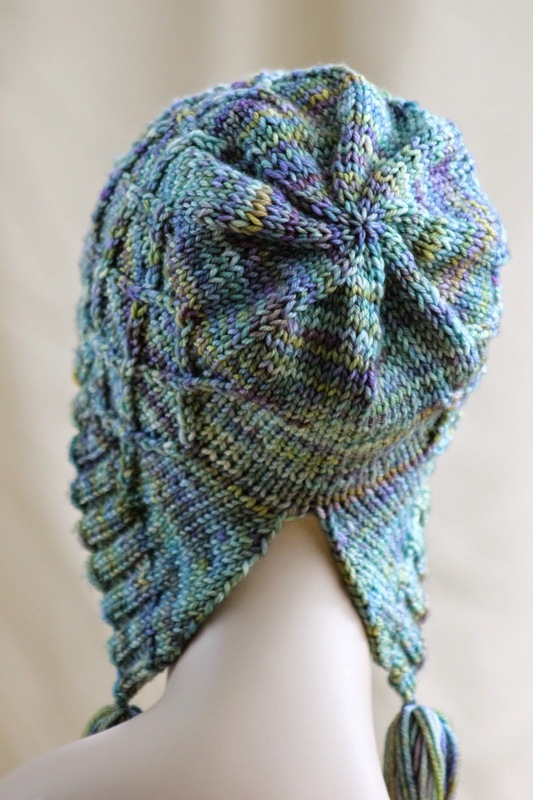 when I see this bonnet I fall in love right a way. This is a very beautifull work bravo !